The System consists of a Progressive Cavity Grout Pump. The progressive cavity pump is a perfect solution when pumping viscous, abrasive or solid laden materials. This pumps is designed to pump neat cement, bentonite, cement/bentonite, ultrafine cements, cement/sand, non-shrink grouts, metallic grouts, self leveling underlayment’s, some repair mortars, plaster, fireproofing and most packaged grout mixes. This pump can also pump heavily sanded grouts, and repair mortars. The pumps are equipped with holding hoppers and hopper screens, various sizes are available. All these grout pumps are designed with variable speed controls to give you complete control over the grout flow. The operator controls are centrally located for efficient, safe production. All components are easily accessible for operating, cleaning, and maintenance. 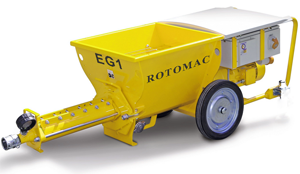 EG1 : Electric Grout Pump with Holding Hopper, Prime mover, Control Panel , Pressure Gauge, Hose & Accessories. EG2 : Electric Grout Pump with Holding Hopper, Single Paddle Mixer ,Prime mover, Control Panel , Pressure Gauge, Hose & Accessories. EG3 : Electric Grout Pump with Twin Paddle Mixers , Prime mover, Control Panel , Pressure Gauge, Hose & Accessories.